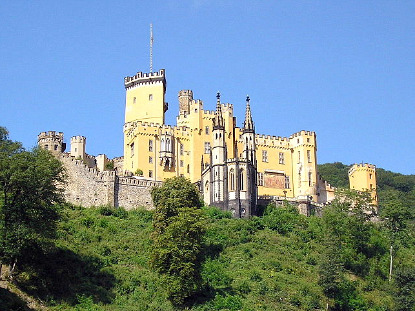 Stolzenfels Castle was originally built between 1242 and 1259 by the Prince-Bishop of Trier. Destroyed by the French in 1689 during the Nine Years' War, the ruins were given by the city of Koblenz to King Frederick William IV of Prussia. 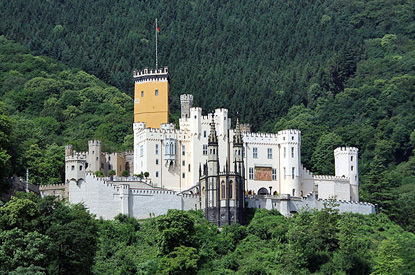 Following the romantic traditions, he completely rebuild the castle in the Neo-Gothic style after 1826 and used it as a summer residence. The castle is open all year round, daily (except Mondays) from 10:00 am to 6:00 pm (to 5:00 pm from October to March). Admission costs 4 € for adults and 2.8 € for concessions, 2 € for students and children until 17 years old.